STORM & MARIE is a fashion brand established in Copenhagen in 2010 by Signe Elisabeth Vedel and Kim Vedel Hansen. The Danish brand is the result of a shared vision of the two who form a couple both professionally and privately. Named after their twins, STORM & MARIE is a passionate endeavor for Signe Elisabeth Vedel and Kim Vedel Hansen. The philosophy behind the brand is that while every collection forms a concept, each piece can still be worn separately and effortlessly be mixed in different ways to create an individual style. A focus on high quality and fit are the core of the 4 yearly STORM & MARIE collections, created by designer Signe Elisabeth Vedel. STORM & MARIE is reflective of her love for the mélange and vintage fashion and the use of references from literature, art and contemporary music. – What motivated you to become a part of NDA? NDA is an exciting initiative. 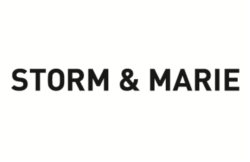 STORM & MARIE is part of the fashion industry and as a company we make a living out of producing and selling clothes. But even though we do so – and actually exactly because of that – we believe that it is important to commit to issues of social responsibility and sustainability and acknowledge that the fashion industry has a responsibility in this regard. At the same time I believe that we are very fortunate to be living in a part of the world where very few people have to suffer because of poverty. That gives us an obligation to help others in need. I just find that it can be difficult to find the actual time to invest in projects when you already have a busy work schedule and a family to take care of. Therefore it is a great opportunity to be able to work with an organisation like NDA, where we can make a difference by contributing with a product that is already an essential part of our business. Also, teenage mothers face a difficult time at a very early point in their lives. They do most likely not have a lot of life experience and are financially dependent on the help of others. STORM & MARIE find it relevant and important to support and help this group so they and not at least their children have a chance of a better future. -Name three values which are important to STORM & MARIE and yourself as a designer? I can emphasize the importance of consideration, which can also be expressed through sustainable and environmentally friendly business practices. STORM & MARIE recently opened a new boutique in Copenhagen where we strive to make the everyday running as sustainable as possible. An example is packaging. Instead of giving our customers a non-reusable plasticbag, we provide them with a reusable fabric bag with our own print, which can be used again and again. We are at the same time planning to sell body oils and fragrances in glas bottles which can be re- used and refilled in our shop. By and large consideration should be an integrated part of the textile industry. Both because it is an industry that polutes extensively, but also because there are many young women and girls around the world who work on textile factories. We have a responsibility for these girls and women – which is something we emphasize in our production. – Are you inspired by Scandinavian culture and trends in your designs? Yes, definately. We strive to design clothes with clean lines and soft colors. – What else inspires you? The colors, structures and elements that you find in nature. In my curent collection I have been inspired by desert landscape. -Who is your typical customer? We appeal to customers of different ages, so in that sense we have a broad target group. Our designs and styles are made for professional use or social events and functions where it is important to radiate energy, creativity and joy, but at the same time maintain a minimalistic and professional look. Give us your heart for Christmas! Calvin challenges you to sign up as a member!